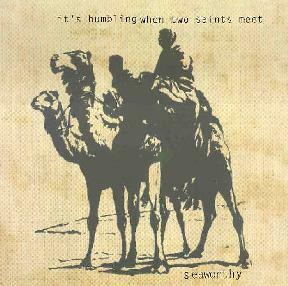 Seaworthy - "It's Humbling When Two Saints Meet"
This is an album for mornings in some distant meadow, or windy days on lonely northern beaches, or quiet summer twilights. Languid guitar and soft piano notes float along against backdrops of pristine silence, or gentle hums and drones of sound. Played by the duo of Cameron Webb and Greg Bird from Sydney, Australia, the music of Seaworthy is haunting and suggestive, with long, lazy, wistful melodies that blow over you like a caressing breeze. Stark, simple, evocative, and beautiful. For more information you can visit the Seaworth web site at: http://go.to/seaworthy. Visit the Steady Cam web site at: http://www.steadycamrecords.com.au. Contact via snail mail c/o Steady Cam Records; PO Box 72; Westmead NSW 2145; Australia.